The fastest way to create a basic hyperlink in an Office document is to press ENTER or the SPACEBAR after you type the address of an existing webpage, such as http://www.contoso.com. Office automatically converts the address into a link. In addition to webpages, you can create links to existing or new files on your computer, to email addresses, and to specific locations in a document. You can also edit the address, display text, and font style or color of a hyperlink. 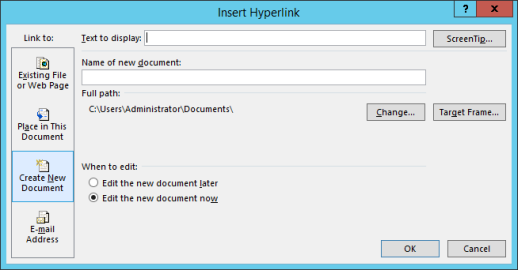 If you want to remove links or stop Office from automatically adding hyperlinks, see Remove or turn off hyperlinks. This article applies to desktop versions of Word, Excel, Outlook, and PowerPoint. 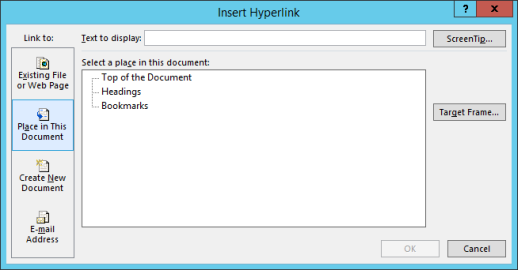 A simplified set of hyperlink features is offered in Office Online. If you have a desktop version of Office, you can edit your document there for more advanced hyperlink features, or you can try or buy the latest version of Office. Select the text or picture that you want to display as a hyperlink. You can also right-click the text or picture and click Hyperlink on the shortcut menu. 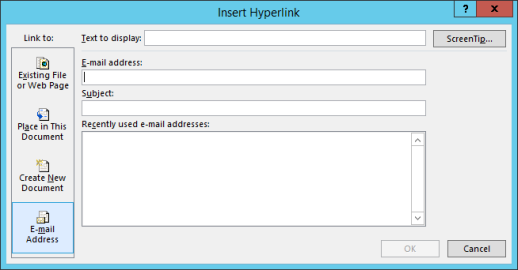 In the Insert Hyperlink box, type or paste your link in the Address box. Note: If you don't see the Address box, make sure Existing File or Web Page is selected under Link to. Optionally, type different display text for your link in the Text to display box. Note: If you don't know the address for your hyperlink, click Browse the Web to locate the URL on the Internet and copy it. Optional: To customize the ScreenTip that appears when you rest the pointer over the hyperlink, click ScreenTip in the top-right corner of the Insert Hyperlink dialog box and enter the text you want. 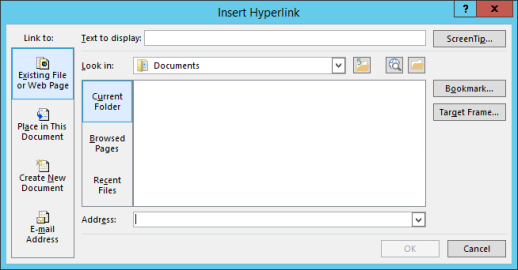 You can add a hyperlink to a file on your computer, or to a new file that you want to create on your computer. To link to an existing file, click Existing File or Web Page under Link to, and then find the file in the Look in list or the Current Folder list. To create a new, blank file and link to it, click Create New Document under Link to, type a name for the new file, and either use the location shown under Full path or browse to a different save location by clicking Change. You can also choose whether to Edit the new document later or open and Edit the new document now. On the Insert tab, click Hyperlink . Under Link to, click E-mail Address. Either type the email address that you want in the E-mail address box, or select an address in the Recently used e-mail addresses list. In the Subject box, type the subject of the message. Note: Some web browsers and email programs might not recognize the subject line. You can also create a hyperlink to a blank email message by simply typing the address in the document. For example, type someone@example.com, and Office creates the hyperlink for you (unless you turned off automatic formatting of hyperlinks). 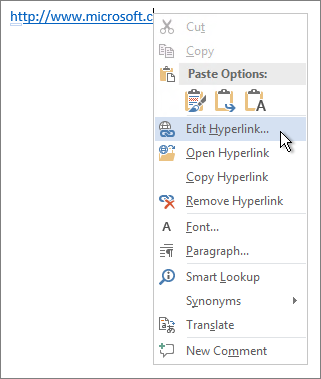 You can create hyperlinks that link to a Word document or Outlook email message that includes heading styles or bookmarks. You can also link to slides or custom shows in PowerPoint presentations and specific cells and sheets in Excel spreadsheets. 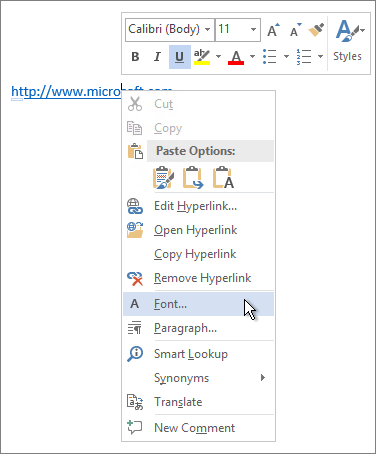 To add a heading style, select your heading text, click the Home tab in Word or the Format Text tab in Outlook, and select a style in the Styles group. In the list, select the heading (current document only), bookmark, slide, custom show, or cell reference that you want to link to. In the Look in box, click the down arrow, and find and select the file that you want to link to. Click Bookmark, select the heading, bookmark, slide, custom show, or cell reference that you want, and then click OK.
To change the address or display text of a hyperlink you added, right-click the link and click Edit Hyperlink. To change the appearance of a hyperlink, such as font style, size, or color, right-click the link and click Font on the shortcut menu, or click a style option on the mini toolbar that appears. To customize the ScreenTip that appears when you rest the pointer over the hyperlink, right-click the link, click Edit Hyperlink, click ScreenTip in the top-right corner of the dialog box, and enter the text you want.